Do you know the number-one language-learning principle to catapult your Spanish fluency? To the enjoy the material! The biggest mistake language learners make is studying boring, difficult grammar material that causes them to fall asleep before they even speak a single word! Do you struggle with learning Spanish and conjugation overload? Do you get confused trying to figure out when to use ser vs. estar? How about placing the accent in the correct place? As a beginner, in fact, studying these is not an effective use of your time nor the best way to learn a new language. Is this how children learn their language skills? Of course not. We believe that hearing engaging and fun stories you can actually understand will create an "emotional glue" between you, the listener, and the newly acquired knowledge. That is exactly what inspired us to continue our series of Spanish Short Stories. Enter Spanish Stories for Beginners, Vol. 2: You will find 10 easily understandable, engaging, and fun stories that will not only help you to dramatically expand your vocabulary, but will give you the tools to improve your grasp of the Spanish language. Boost your comprehension, grow your vocabulary, and spark your imagination with these 10 unconventional Spanish short stories! All stories are written using vocabulary you could easily use in your day-to-day conversations. The stories are written with beginner Spanish learners in mind. With that said, it is highly recommended to have a basic understanding of Spanish to achieve maximum enjoyment and effectiveness of the lessons. This program is excellent for those who want to get an introduction to the language or brush up on their Spanish language skills. Each story contains an important lesson in the Spanish language (verbs, adjectives, past tense, giving directions, and more), involving an interesting and entertaining story with realistic dialogues and day-to-day situations. A summary in Spanish and in English of what you just hear, both to review the lesson and for you to gauge your comprehension of what the tale was about. At the end of those summaries, you’ll be provided with a list of vocabulary found in the lesson, as well as phrases you may not have understood the first time! Finally, you’ll be given clever questions in Spanish so you can prove you learned something in the stories. Even if you have failed multiple times in the past to learn Spanish, these short stories will give you the rocket fuel you need to finally grasp the language! 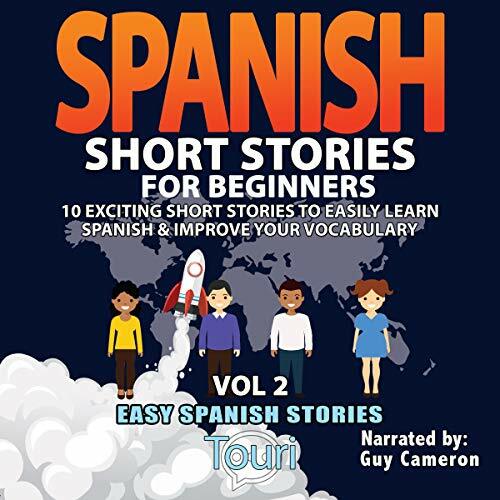 Act now and grab your copy of Spanish Short Stories for Beginners, Vol. 2 and start learning the fun way! The stories with day-to-day situations are clear and easy-t0-grasp. The audio guide has its certain enchantment that you'd like to hear the stories again and again. In fact, I wasn't even overwhelmed in spite of the lengthy discussion. Nice one! I am making a big difference with this audio book. And since Spanish is the second most spoken language here in America, I became more intrigued and passionate to be well-versed with it. This Spanish audio guide by Touri Language learning is a reliable book to pick up the said language fast and have pleasure studying it. Ever since I started watching one of Netflix's trending Korean drama, "Memories of Alhambra", I began to take interest of the Spanish language. A friend suggested an ebook but since I lack the time, I decided an audio book will do well. And true enough, this is suiting me well. I also plan to get the first version of this book and see what I missed out.